Douglas Elton Thomas Ullman was born May 23, 1883, in Denver, CO. His mother's first husband was John Fairbanks, a wealthy New Orleans sugar mill and plantation owner, but, after having one son, he died of tuberculosis. She was swindled out of her husband's fortune by his business partners. His attorney, Charles Ullman, was unsuccessful in regaining any of the fortune. She next married Edward Wilcox and had one son by him. However, he was an alcoholic, and she soon divorced him. Representing her in her suit was Ullman whom she married next. Moving to Denver in 1881 to be with him, they had a first son, Robert in 1882, then Douglas in 1883. Reportedly, Ullman left Douglas' mother as a result of her philandering, and she raised Douglas and his brother with the last name Fairbanks. Fairbanks did some acting in Denver when still a teenager and moved to New York in the early 1900's to further pursue his acting career. He had spent time working in a hardware store and as a clerk in a Wall Street office before making his Broadway debut in 1902. In 1907, he married Anna Beth Suly, the daughter of a wealthy industrialist, and they had one son, Douglas, Jr. In 1915, they movied to Los Angeles. 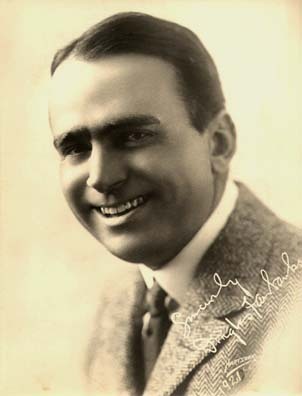 While enjoying a successful stage career in New York, he was asked to come to the west coast by Harry Aitken, who, along with his brother, had formed the Triangle Film Corporation, so named because it consisted of three of the biggest producers/directors of the day -- D.W. Griffith, Thomas Ince and Mack Sennett. Aitken gave Fairbanks to Griffith, who, unimpressed with Fairbanks style of acting, felt he was more suited for Mack Sennett comedies. However, his first film, which Griffith passed off to longtime assistant director W. Christy Cabanne, was a success. Although based on one of Fairbanks' most successful stage plays, writing credits for "The Lamb" (1915) are attributed to Granville Warwick, a pseudonym used by Griffith. His movies were soon being written by the husband-wife team of Anita Loos and John Emerson who provided stories that were perfect for Fairbanks athletic, go-getter acting style and continued to bring him success and increase his popularity. He met Mary Pickford for the first time at a party in 1916 while she was still in an unhappy marriage with Owen Moore. By the time he, Pickford and soon-to-be close friend Charlie Chaplin started on a series of appearances around for the country in 1917 for the War Bond Drive, he and Pickford were having an affair. In 1919, Fairbanks, Pickford, Chaplin and D.W. Griffith formed United Artists in order to protect thei independence and avoid control by the studios. Fairbanks divorced his wife in 1918, and Pickford divorced Moore in 1920. The couple married 26 days after Pickford's divorce was finalized. In 1920, Fairbanks decided to try something different and made "The Mark of Zorro," thinking he would go back to the style of filmmaking he had been doing for the past five years. He did make one more film of that type, but when he saw how successful "Zorro" had become, he spent the rest of his career establishing himself as the silent screen's most popular swashbuckler with films like "The Three Musketeers" (1921), "Robin Hood" (1922), "The Thief of Bagdad" (1924), "The Black Pirate" (1926) and "The Gaucho" (1927), among others. His films were spectacular, expensively made productions and, as a result of Pickford's continually growing success, the two became Hollywood's "King and Queen," the two most popular film playes in the world and being mobbed wherever they went. By the time he and Pickford made their first talkie (and their first film together), "The Taming of the Shrew" (1929), their marriage was on the decline. Fairbanks' restlessness had him on the move constantly, they officially separated in 1933 and divorced in 1936. Fairbanks immediately married Sylvia, Lady Ashley. His last film was "The Private Life of Don Juan" in 1934. On December 12, 1939, he had a mild heart attack and died later that day at age 56.